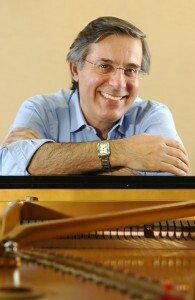 The Brazilian-born pianist Arnaldo Cohen, now a Professor at Indiana University, has long had a reputation for astonishing his audiences with the musical authority and blistering virtuosity of his performances. His graceful and unaffected platform manner belies playing of white-hot intensity, intellectual probity, and glittering bravura technique bordering on sheer wizardry. Long in demand internationally, Mr. Cohen has in the past few years entered a rarefied echelon among performers in America as well. He is regularly invited to appear as soloist with major orchestras, notably with the Philadelphia Orchestra under the distinguished conductor Wolfgang Sawallisch, and with such ensembles as the Cleveland Orchestra and the Los Angeles Philharmonic. His solo recitals everywhere draw enthusiastic crowds of cognoscenti. Critics, too, marvel at his mixture of musical complexity and élan. After winning First Prize at the 1972 Busoni International Piano Competition, Mr. Cohen scored a triumph in a solo recital at the Concertgebouw in Amsterdam. He then went on to build a repertoire of some 50 concertos and, from his base in London, performed with such orchestras as the Royal Philharmonic, the Philharmonia, the Bavarian Radio Symphony Orchestra, Orchestra de la Suisse Romande, and the Santa Cecilia Orchestra of Rome, collaborating with conductors Kurt Masur, Kurt Sanderling, Klaus Tennstedt, and Yehudi Menuhin (who described Cohen as “one of the greatest pianists I have ever heard.”). “An underground swell of admiration, if not quite a cult, has developed around this dapper musician,” wrote critic Allan Ulrich, “this is a fabulous talent.” (San Francisco Chronicle, November 16, 2001) As a former professional violinist, teacher of physics, mathematics, cocktail pianist, and avid soccer fan, Mr. Cohen’s unconventional background contributed to the aura of surprise and discovery that attended virtually every one of his public performances – a quality that greatly enhanced his success in the major concert halls of Europe and later the United States. Mr. Cohen’s interpretations have been greeted with such sweeping accolades as “magisterial,” “thrilling,” “intrepid,” “exultant,” and “trenchant” – all of which are a metric of Cohen’s extraordinary pianism. In many cases his playing has on different occasions drawn favorable comparisons with the work of such very different artists as Richter, Horowitz, Arrau, Argerich, Serkin, Gieseking, Lupu, and Kissin, a testament to the protean nature of his musicianship and virtuosity. Despite these comparisons, however, Mr. Cohen has developed a voice entirely his own. He is a big pianist. His sound is splendid and full, and never clattery… He has the control to build long phrases of noble melody, and his runs are executed with immaculate precision, by fingers of absolutely equal force.